With the inevitable demise of CSGO skin betting after Valve shut down API access to sites offering such a service, a number of esports only bookmakers have emerged. The most significant of these so far is GG.BET. It launched on August 19th, 2016 using Ultraplay’s esports odds service as the backbone of their site. With a gambling license from the Curacao EGaming Licensing Authority, GG.BET can offer real money wagering to the majority of countries you’d expect. The most notable exception is the United Kingdom, whose residents are not allowed to join. GG.BET proudly state that the sportsbook was setup by Esports enthusiasts and former professional gamers, which puts them in a good position to offer a strong esports betting product. There’s a nice GG.BET bonus when you join and deposit, whereby they will match your first deposit up to $100. At the moment, they’re also offering another $10 bonus free once you’ve placed a bet. You can claim your GG.Bet bonus by clicking here to sign up. GOODGAME100 – Up to $100 deposit bonus. Enter the code, make a deposit and get a bonus that matches your first deposit. GGFREEBET – $10 free. Place at least one bet, enter the code and get $10 bonus completely free. Very little is known about the company behind GG.BET and due to them being so new to the scene, it is hard to find out much about them. They do have a license, albeit from Curacao, which adds some legitimacy. It is a promising sign that they do not accept customers from countries such as the UK and the USA, which some Curacao licensed bookmakers do. This suggests that GG.BET are aiming to act legally. There are a few users on reddit who claim they have had problems withdrawing and issues with the free bet turnover, however the free bet turnover conditions are clearly outlined on the GG.BET website. These sort of issues are going to be rife on reddit while users adjust to how traditional sports betting websites work. You will likely need to verify your account if you want to deposit large amounts and deposit offers frequently have turnover requirements, which people aren’t used to yet. There’s nothing that concerns us about GG.BET so far. A lot of the more well-known traditional bookmakers still provide a very basic esports offering. GG.BET on the other hand has a wide selection of markets for you to bet on. On top of the normal match winner markets you can bet on handicaps, total map handicaps (if a Bo3 or Bo5), over 26.5 rounds, pistol round winners, odd or even final scores and map winners. Once a match goes in-play you’re able to bet on whether either team will end up with a 10 round winning streak or whether the terrorist side will plant the bomb in each round, which is a unique offering. You can also bet on the result in-play, so if a match has started you can bet on the second map result and handicaps. They don’t offer round by round betting just yet. GG.BET have one of the best range of markets available for CSGO. Due to the fact GG.BET only launched in 2016 they have little esports history to speak of. They are currently advertising aggressively on sites such as HLTV, so we expect they have enough financial backing to make an impact on the CSGO community. They are currently a sponsor of Fnatic. 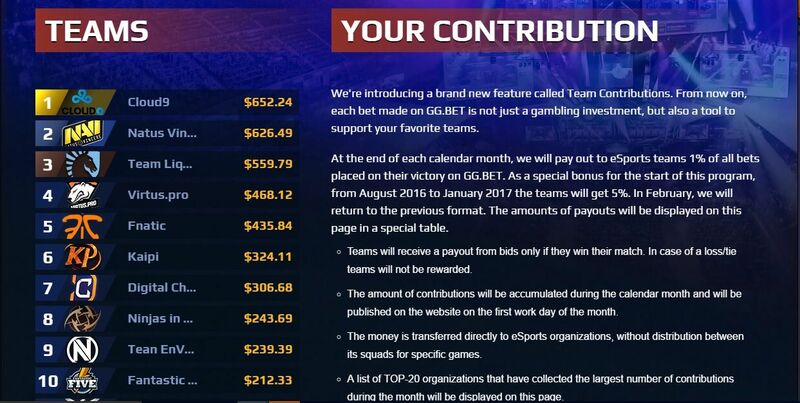 The one way GG.BET do stand out is with GG.BET team contributions. This is an innovative approach whereby at the end of each month, teams who have won a match on which there is betting, will be paid 1% of the total amount bet on them to win the game. Up until January 2017, the rate was boosted to 5%, which means teams such as Cloud9 and Na’Vi are making around $1000 per month for doing nothing except winning matches. This is a nice touch that helps to support the CSGO scene grow. Most of the major payment options are available such as Visa, Mastercard, Skrill, Neteller, EcoPayz, Webmoney, Yandex, Qiwi and Alipay. GG.BET offer Bitcoin CSGO betting too, unlike most bookmakers. Due to our team being based in the UK, where GG.BET do not accept customers, we have been unable to check verification process for withdrawals. Typically you’ll need to verify your identity prior to making your first withdrawal. This is to make sure you are of a legal age to bet to ensure GG.BET are adhering to their gambling license requirements. Much effort has been made to supply readily available customer service to GG.BET customers. There is 24/7 live chat, telephone and email support. If you have a problem we recommend using live chat for a swift resolution to your issues. GG.BET has a bright and colourful layout much like you’d expect an esports only bookmaker to offer. When you click into the game you want to bet on you’ll see an embedded Twitch stream so you need not even leave the site to watch the game. Due to the simple layout, every betting opportunity is located in the middle of the page which makes finding which game you want to bet on very easy. Odds are displayed in decimal format which is what most non-UK residents will likely be used to, because decimal odds are standard throughout Europe. If you put 10 euros on a bet at odds of 2.00 which wins, you’ll double your money. You are able to create multiple bets by adding selections to your betslip and clicking on “Express” (we have no idea why it’s called “Express” – that doesn’t make sense to us!). Here you can increase your winnings by adding more selections to your bet. Remember, all must win in order to get a return. They only offer esports betting markets, so there are no other sports available. GG.BET don’t offer a casino or any other products yet. If you’d like to play casino, we’d suggest betting on CSGO at GG.BET and then signing up at Casumo to play casino. In terms of esports only bookmakers GG.BET offers a seriously good platform. We look forward to them obtaining a UK license so we can try them out properly. If you’re living in a country where they accept customers, you should sign up. There’s such a wide range of matches and markets to bet on that it’s worth having an account – plus you can get the $100 bonus by signing up here.